IGNOU Online Entrance test for MPhil, PhD Admissions 2019, Apply online/ IGNOU MPhil, PhD Admission 2019: Entrance Test on April 4, online application forms: The Indira Gandhi National Open University (IGNOU) today announced admissions to its PhD and M.Phil programmes for July 2019 session in regular mode. A national-level entrance exam will be conducted on April 7 in selected examination centres across the country, Director of IGNOU Research Unit Prof. Kaustuva Barik said. The last date to submit application form is March 25 and the online portal for admission to the programmes will be operational from March 07. 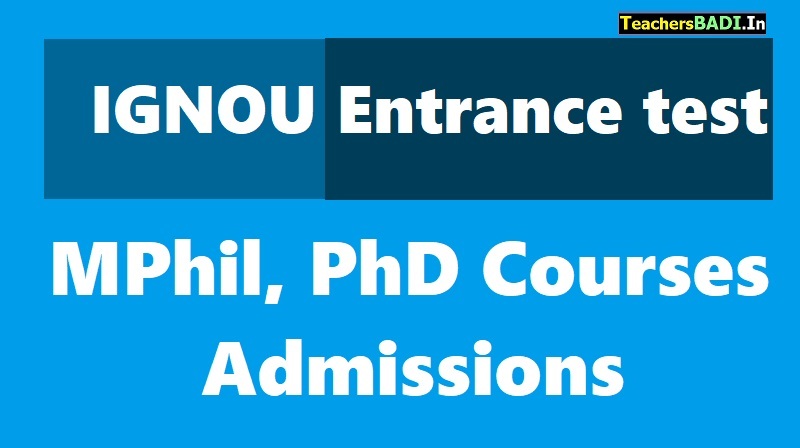 GNOU invites applications for admission to M Phil and PhD programmes: The Indira Gandhi National Open University, New Delhi has invited online applications for admission to M Phil/PhD programmes for July 2019 session. M Phil programmes are available in chemistry, commerce, journalism and mass communication, translation studies and PhD programmes in bio-chemistry, chemistry, commerce, English, education, environmental science, fine arts, gender and development studies, geology, Hindi, journalism and mass communication, management, music, rural development, social work, statistics, translation studies, women’s studies. The entrance test in these disciplines shall be conducted on April 7, 2019. Candidates can login to http://onlineadmission.ignou.ac.in/entrancersunit for details. The last date for submission of online applications is March 25, 2019. The IGNOU Research Programmes are offered (Regular Mode) in strict compliance with University Grants Commission (Minimum Standards and Procedure for Award of PhD/MPhil Degrees) Regulations, 2016. Applications are invited for - M.Phil in Sociology, Political Science, Economics, Geography, Translation Studies, Social Work, Commerce, Chemistry and Distance education. PhD programmes have been offered in – Psychology, Anthropology, Sociology, Library and Information Science, Political Science, Public Administration, History, Gender and Development Studies, Women’s Studies, Geography, Translation Studies, Statistics, Food & Nutritional Sciences, Environmental Studies, Geology, Management, Life Sciences, Commerce, Hindi, Distance Education, Nursing, Social Work, Physics, Chemistry and Biochemistry. "PhD in Bio-chemistry, Physics, and Life Sciences disciplines would not have an entrance exam and would be based on eligibility criteria available on the university's website," Barik said in a statement. Those applying for M.Phil in Economics need not take the entrance exam but have to be eligible as per the criteria. IGNOU PhD and MPhil Admissions 2019 Registrations on the official website of the Indira Gandhi National Open University (IGNOU) onlineadmission.ignou.ac.in. IGNOU has released a notification inviting candidates for admissions to regular programmes for its PhD and MPhil courses. The application process is scheduled to begin and candidates interested in joining the July 2019 programmes must apply on or before 25th March 2019. While the PhD programmes will span 5-Years, the MPhil programmes are for 4-Years only. IGNOU is scheduled to conduct the national-level entrance exam for PhD and MPhil July 2019 Admissions on 7th April 2019 at its various exam centers across the country. However, as per the official notification, there would be no entrance exam for admissions to bio-chemistry, physics, life sciences and economics disciplines. Candidates shortlisted via entrance exam will be called for Stage 2 of selection process that will include an interview and presentation of Synopsis. The tentative list of selected candidates will be released by .. and selected candidates will be intimated via offer letters. MPhil admission is offered in – Sociology, Political Science, Economics, Geography, Translation Studies, Social Work, Commerce, Distance Education and Chemistry discipline. The applicants must possess a Master’s degree from a recognized university or equivalent qualification with minimum 55% marks for unreserved category and 50% marks for reserved category candidates. The Indira Gandhi National Open University (IGNOU) has issued an official notification, inviting candidates to apply for its PhD and MPhil programmes (regular mode). The new session will begin from July. The last date for submission of application is February 16. Interested candidates can submit the same at the official website – onlineadmission.ignou.ac.in. The entrance test will be conducted on April 07. The maximum duration of the PhD and MPhil programmes are 5 years and 4 years respectively. A national-level entrance exam will be conducted in selected examination centers across the country, Director of IGNOU Research Unit said. No entrance test will be conducted for bio-chemistry, physics, and life sciences disciplines. IGNOU is considered as the largest open university system in the world. In 2010, UNESCO declared IGNOU as the largest institution of higher learning in the world. Note: This application is best viewed using current versions of Firefox, Chrome at a screen resolution of 1024 x 768 or higher.This application will not work in Internet explorer Ver 11 and above. 1. Click on "LOGIN" button from the homepage of Online Entrance Test and then login with your Username and password by clicking the "LOGIN" button given on the login screen. 2. Fill personal details, programme details, qualification details and correspondence details. a. Payment by Debit/Credit Card (Master/Visa/Rupay): You have to select Debit/Credit Card option to pay the application fee and follow the online instructions to complete the payment of fee. After successful payment, you will be able to print/save the payment confirmation slip. b. Payment by Net banking : If you have net banking account select this option. You will be redirected to your bank website. Candidates can read through the official information brochure below and ascertain their eligibility in relevant disciplines and check the syllabus. IGNOU MPhil, PhD Admissions 2019: The Indira Gandhi National Open University (IGNOU) has released an official notification inviting all the interested, eligible candidates for PhD and MPhil programmes. As per schedule, the application process for the same will begin from January 23. The university offers about 228 certificate, diploma, degree and doctoral programmes, with a strength of nearly 810 faculty members and 574 academic staff at the headquarters and regional centres and about 33,212 academic counsellors.